Albion Faeries do not seek to be bound by strict policies but rather to share and grow our values, ethics and principles together in mutual love and respect. We hope to be open to development and improvement. So, at the moment, the following is the way we aim to conduct ourselves together. We want all meetings and decisions to be as open and transparent as possible. We need to overcome any suspicion that things are being done behind the scenes and not fully owned by the whole community. We don’t have a formal membership, but we do seek to notify all who currently come to gatherings and Albion circles, and invite further participation from those who then identify as part of the Radical faeries of Albion. We need to be practical and acknowledge that not everyone can always be present at everything but may still be kept in the loop. People who are not fully involved can still receive a general regular “public” mail-out. People agreeing to host meetings at their private spaces are entitled to have some say on who has their private address. In addition, there is a practical scope for smaller, more focused working-party-style meetings for selected people, as well as an absolute necessity for large general assemblies; those are open potentially to all radical faeries. 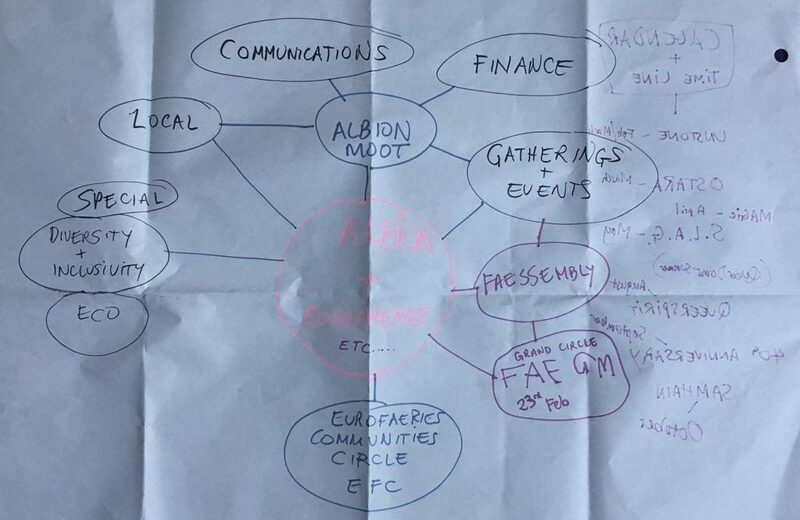 All of our Albion Fae-assembly meetings need to be advertized to the current community before they take place and due notice given to those who are currently coming to gatherings and events (unless an emergency situation arises). All Core Circle meetings should be similarly notified. However, the scope of some meetings may be limited to those who are already actively working on the subject or who seek to do so in future. Observers who wish to learn how things are done may request to attend without full involvement. All large residential gatherings must include a scheduled time for a general assembly where representatives from Core Circles and working groups update the community on issues, and where all major decisions must be proposed and agreed. The Stewards Circle must ensure that these general assemblies do take place at least twice a year in geographically disparate parts of Albion. Working groups are free to arrange informal discussions to work through practical issues and details but are not empowered to make decisions on behalf of the Albion Faerie community. Decisions that impact widely must be referred to Core Circles or Faessemblies. All of the day-to-day work needed to keep us going is conducted via 3 Core Circles. Any Albion Faerie may attend any Core Circle if they wish to help with this work. The Finance Circle oversees all matters relating to Finance. The Communications Circle oversees all matters relating to Communication. The Gatherings and Events Circle similarly oversees how we organize gatherings and events. All roles are related to tasks or specific areas of work that are undertaken as a service to the community. Roles and tasks may be done over a shorter period but generally it is requested that this service is pledged for at least a twelve-month period. Roles/tasks may be shared by mutual consent. All folk undertaking major roles/tasks are requested to find at least 2 back-up people: one an “elder” who has previous experience in the area; the other a “neophyte” who wishes to learn and grow into such a role/task. Key Volunteer Roles are Facilitators and Minute Takers. These roles are essential for successful meetings. They can be done on an occasional basis without ongoing commitments. However, folk volunteering for these roles are advised to be well prepared and competent. Circles can appoint and agree as many other specific volunteer roles as may be needed. For instance, Working-party leaders will be needed to take on specific tasks and see them through between circle meetings. They should also liaise with one or more Core Circles. The main tasks of Convenors and Record-keepers happen before and after meetings rather than at them. To arrange venues and facilities so that circles can meet in an appropriate and accessible manner. To maintain an overview of what is happening in Rad-Fae circles and co-ordinate with other Stewards. It is asked that all 3 Core Convenors liaise with each other to co-ordinate between Stewards Circles and prepare for these. And the 3 Record-keepers liaise on training a “bank” of other volunteers in admin and minute-taking and ensuring who may be present and available through the year. These roles and tasks are still in development. We hope that wherever there are enough numbers of Radical faeries living close by, they will choose local stewards to take on specific tasks. They may choose a local representative to liaise with the wider network and so to be part of the Stewards Circle. Other than working-party leaders, there may Stewards who pledge to undertake specialist work voluntarily for the community as they have specific skills or qualifications. One such is our Book-Keeper.